Elite Trimworks offers an extensive line of square TAPERED exterior PVC column wraps. Finding the right column to fix the specific architectural order or style that you are looking for has never been easier. We believe that PVC Column Wraps are the highest quality product for the least amount of cost for exterior applications. 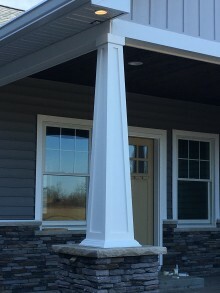 These columns are environmentally friendly and can be free standing or easily installed over an existing wooden or steel post. PVC column wraps are quick and easy to install as well as lightweight, strong and paintable. They hold up to warping, shrinkage, decay, insects and they don't ever need to be painted. Made with the same PVC used for decking, outdoor mouldings and trim boards. 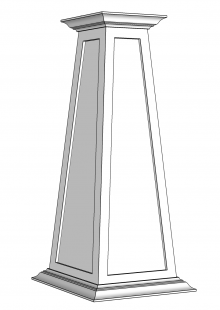 When trimming the column height on site, it is important to not cut into the panels or have too much space above or below them. These columns are precision made to order, once you choose the height, we will insure the panels are sized perfectly. 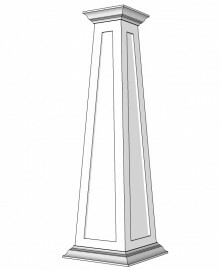 Our tapered, paneled PVC columns are available up 12 feet tall. We are presently adding more sizes to the products listed on this page. If the size that you are looking for is not listed, contact us for pricing.